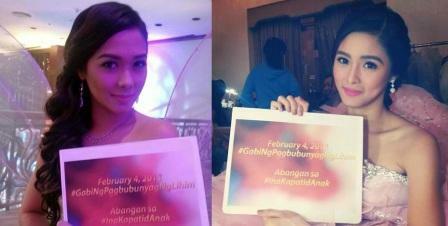 'Ina Kapatid Anak' Unveils a "Gabi ng Pagbubunyag ng Lihim" Episode This February 4! ABS-CBN's no.1 primetime family drama series "Ina Kapatid Anak" will make next week more memorable to its fans, especially to the solid supporters of its lead stars Kim Chiu and Maja Salvador, as the highly-anticipated 'Gabi ng Pagbubunyag ng Lihim' (night of revelations) episode happens this Monday (February 4). What truly happened on the night when Teresa (Cherry Pie Picache) gave birth to Celyn (Kim)? When did the connivance between Beatrice (Janice de Belen) and Oscar (Jayson Gainza) start? Once the whole truth is revealed, who between Celyn and Margaux (Maja) is the real victim of the unfortunate happenings of the past?